UFO SIGHTINGS DAILY: Is Richard Branson Trying To Contact Aliens? Taking Submarine Into Great Blue Hole. Nov 2018, UFO Sighting News. Richard Branson is about to take his mini submarine down a deep hole he named the Great Blue Hole. The hole is big enough for two 747 jets to fit easily across its opening. 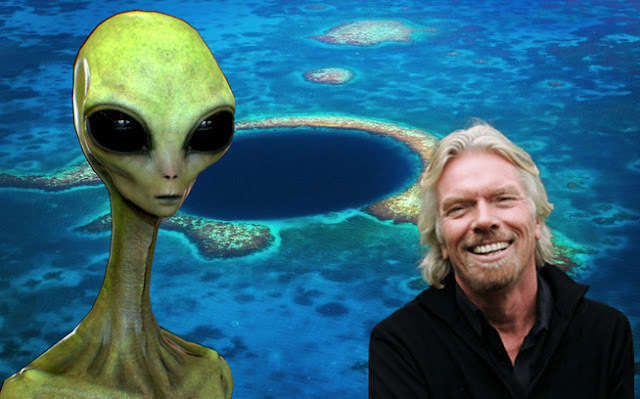 But the real question is...is Sir Richard Branson attempting to make contact with an alien species? You see, this giant hole is well located so that people would almost never be around it, leaving it very secluded of a location and safe for UFOs to exit and enter without worries of being seen. However it seems that Branson wants to explore it and if he does actually come near an underground alien base...what will aliens do to him? Thats an interesting question and one of the answers is that they may capture him and keep him, forbidding him to leave so that no one would find out about the base. Another scenario might have aliens instantly destroying the submarine...seeing it as a threat to their territory and not giving a damn who is in the submarine. That last one scares the hell out of me and may have a higher chance of happening if he encounters aliens. Lets just hope he comes back safe.